We examined visual selective attention under perceptual load—simultaneous presentation of task-relevant and -irrelevant information—in healthy young and older adult human participants to determine whether age differences are observable at early stages of selection in the visual cortices. Participants viewed 50/50 superimposed face/place images and judged whether the faces were male or female, rendering places perceptible but task-irrelevant. Each stimulus was repeated, allowing us to index dynamic stimulus-driven competition from places. Consistent with intact early selection in young adults, we observed no adaptation to unattended places in parahippocampal place area (PPA) and significant adaptation to attended faces in fusiform face area (FFA). Older adults, however, exhibited both PPA adaptation to places and weak FFA adaptation to faces. We also probed participants' associative recognition for face-place pairs post-task. Older adults with better place recognition memory scores were found to exhibit both the largest magnitudes of PPA adaptation and the smallest magnitudes of FFA adaptation on the attention task. In a control study, we removed the competing perceptual information to decrease perceptual load. These data revealed that the initial age-related impairments in selective attention were not due to a general decline in visual cortical selectivity; both young and older adults exhibited robust FFA adaptation and neither group exhibited PPA adaptation to repeated faces. Accordingly, distracting information does not merely interfere with attended input in older adults, but is co-encoded along with the contents of attended input, to the extent that this information can subsequently be recovered from recognition memory. Age-related changes in selective attention have traditionally been examined using manipulations of executive attention, e.g., the capacity to selectively maintain targets and suppress distractors in working memory (WM) (Hasher and Zacks, 1988; Gazzaley et al., 2005, 2008; Healey et al., 2008). Under cognitive load from WM, older adults appear more susceptible to interference from distracting stimuli compared with young controls. At the neural level, executive attention appears to reconcile interference from unattended distractors at stages of processing after encoding in the perceptual cortices, i.e., late selection, and relies on prefrontal control mechanisms (de Fockert et al., 2001; Gehring and Knight, 2002). Experimental tasks that manipulate executive attention, such as distractor exclusion (de Fockert et al., 2001; Yi et al., 2004) and attentional blink (Luck et al., 1996; Marois et al., 2000) have routinely demonstrated late selection of unattended information. However, the focus of aging research on executive attention and distractor interference has left several questions unexplored. Executive attention appears to be dissociable from the type of perceptual attention used for reconciling distractor competition within the visual field, which is thought to be embedded in posterior cortical subsystems (Treisman, 1969; Desimone and Duncan, 1995; Lavie et al., 2004). For instance, Yi et al. (2004) observed that under perceptual load but not WM load, unattended distractors were suppressed at stages of visual processing before extrastriate encoding. These finding indicate that perceptual attention relies on a distinct early selection mechanism. In the present study, we therefore explored with functional magnetic resonance imaging (fMRI) whether perceptual attention is also susceptible to an age-related impairment. We hypothesized that under perceptually demanding conditions, when task-relevant and -irrelevant stimuli were simultaneously presented in the visual field, early competitive perceptual interactions from task-irrelevant sensory information would be successfully filtered in younger adults before encoding (Lavie, 1995; Yi et al., 2004). By contrast, if older adults do exhibit impaired perceptual attention, then age-differences in distractor encoding should be observable in extrastriate cortex sensitive to the unattended stream of input. We were also interested in elucidating the precise neural fate of this unattended information in older adults. Specifically, do distractors merely interfere with attended input, or are distractors co-encoded along with the content of attended input to the extent that they can subsequently be recognized? To interrogate these hypotheses, we acquired fMRI while a group of healthy young (mean age = 22.2 years) and older (mean age = 77.4 years) adults viewed 50/50 threshold superimposed face and place images (O'Craven et al., 1999; Yi et al., 2006) (Fig. 1a). Participants decided whether faces were male or female, rendering place information perceptible but irrelevant to the task. Stimuli were presented 5 times in a randomized event-related design, thereby allowing us to index dynamic stimulus-driven competition from place information while restricting directed attention to faces over an extended repetition sequence. To index recognition memory for unattended places, we also probed participants' associative recognition for face/place pairs 10 min subsequent to the attention task. Fifteen healthy right-handed young (10 females; mean age = 22.2, SD = 2.7 years; mean education = 15.8, SD = 1.9 years) and 15 healthy right-handed older adults (7 females; mean age = 77.4, SD = 3.1 years; mean education = 15.6, SD = 3.1 years) participated in this Institutional Review Board approved study. Participants' medical histories were screened for incidence of prior head injury, mental health issues, chemotherapy or cranial radiation therapy, and neurological disorders. The two groups performed equivalently on common neuropsychological measures of general cognitive function, the Mini-Mental State Exam (MMSE) (young: MMSE = 29.2/30, SD = 0.8; old: MMSE = 29.7/30, SD = 0.4; scores of 27–30 indicate normal cognitive function) and the Short Blessed Test (SBT) (young: SBT = 0/0, SD = 0; old: SBT = +0.71/0, SD = 1.3; scores of 0–4 indicate normal cognitive function). All subjects had normal or corrected-to-normal visual acuity. Written informed consent was obtained before study procedures. Two participants were removed from subsequent fMRI analyses, one young control due to scanner malfunction and one older adult in whom we were unable to localize the FFA. High resolution front-view photographs of nonexpressive faces were obtained from several psychological and computer-recognition image databases (Hond and Spacek, 1997; Lyons et al., 1998; Martinez and Benavente, 1998). In total, 250 photographs (125 male, 125 female) were selected. The faces were first cropped to remove hair and other nonfacial features, gray-scaled, and then equated by size; stimuli subtended 11° at ∼115 cm viewing distance. To prevent discrepancies in the spatial orientation and location of the face stimuli over trials, we used custom Matlab scripts to individually record the location of the eyes and philtrum of each image. These coordinates were averaged to create a standard 3-point Cartesian face-space. Each individual image was iteratively coregistered into this standard face-space using a linear conformal (rigid body) transformation. Luminance and shading was equated using a similar two-step mean correction procedure. High-resolution interior and exterior photographs of houses were obtained from several real-estate websites. In total, 110 images were selected. The images were cropped to remove unrelated peripheral information, gray-scaled, and equated for size; stimuli subtended 11° at ∼115 cm viewing distance. Luminance and shading were normalized between images. For experiment 1a, stimuli were composed by superimposing a 50% transparency face over a house (O'Craven et al., 1999). No stimuli were repeated between tasks; the face/place localizer, experimental task 1a, and control adaptation task 1b each used a nonoverlapping subset of the above stimuli set. The block-design object localizer task consisted of alternating epochs of face photographs and place photographs. Participants made male/female decisions in the face blocks and interior/exterior decisions in the place blocks. We used a perceptual discrimination task to limit demands on working memory and associated cognitive resources (Fig. 1a). Each face/place stimulus was presented 5 times in a randomized event related sequence (Henson et al., 2000), with stimulus durations of 2 s, and a variable stimulus onset asynchrony (SOA) ranging from 2 to 12 s (mean of 4.5 s) (Birn et al., 2002). Participants decided whether the face component was male or female. The 2 s stimulus duration was chosen to allow ceiling performance on the task in both groups. During nonstimulus periods in the task sequence, a central fixation cross was continuously presented. Four sequential sessions were acquired in total, separated by a brief rest period. Session order was counterbalanced across participants. After completing the four experimental sessions, we then collected a series of structural scans (∼10 min duration), followed by a face-place associative recognition task unanticipated by the participants. Each self-paced trial of the recognition task consisted of a face presented at the top of the display with 2 nonoverlapping place images presented in the lower left and right side of the display. One of the places was previously paired with the face (match) and the other was novel (mismatch); location of match and mismatch places was counterbalanced across trials. Participants were exposed to the entire set of previously viewed faces/place images from the adaptation task. Trials terminated when participants generated a response to a face-place pairing. In each trial of the control perceptual attention task, two faces were presented in succession (250 ms durations separated by 500 ms of blank screen), comprised of either the same (repetition, 50 trials) or different faces (alternation, 50 trials), with a variable SOA ranging from 2 to 4 s (mean of 3 s). Participants monitored the stimulus sequence for occasional inverted faces embedded within a repetition or alternation sequence (20 target trials). The inverted face detection task was intended to promote attentional engagement across all trials of the experiment, while restricting nonperceptual processes (e.g., motor responses) to target trials. Faces did not repeat between trials. Before scanning, participants were provided with instruction and practice on the fMRI task. The experiments were designed and implemented using the software package Presentation (version 9.81; NeuroBehavioral Systems). Slice acquisition and stimulus delivery were synchronized via a parallel port cable that monitored low-amplitude TTL pulses. Stimuli were presented on a rear-mounted projection screen, set at a (native) 1024 × 768 resolution. The order and timing of stimuli presentation sequences for experimental tasks 1a and 1b were determined using Optseq (http://surfer.nmr.mgh.harvard.edu/optseq/). Imaging data were collected with a Siemans Allegra 3.0-Tesla scanner operating at a slew rate of 400 mT/m/ms and a 12-channel asymmetric gradient head coil. Parameters for high-resolution T1-weighted structural volumes were as follows: 3D magnetization prepared rapid gradient echo pulse (MP-RAGE) sequence; repetition time (TR) = 2000 ms; echo time (TE) = 2.63 ms; matrix = 256 × 160; field of view (FOV) = 256 × 256; slice thickness = 1 mm; 160 axial oblique slices. Parameters for T2*-weighted gradient-echo echoplanar image (EPI) pulse sequences were as follows: TE = 30 ms; TR = 2000 ms; flip angle = 70°; acquisition matrix = 64 × 64; FOV = 200 mm. Thirty axial oblique slices of the brain were acquired at each time point, with a voxel resolution of 3.1 × 3.1 × 5 mm, no skip between slices. Functional activation was determined from the blood oxygenation level-dependent (BOLD) signal using the software Statistical Parametric Mapping (SPM5, University College London, London, UK; http://www.fil.ion.ucl.ac.uk/spm/software/spm5). Following image reconstruction and slice time correction, the time series data for each participant were motion-corrected and coregistered with their T1-weighted structural image. The T1 image was bias-corrected and segmented using template (ICBM) tissue probability maps for gray/white matter and CSF. Warping parameters were obtained from the tissue segmentation procedure and subsequently applied to the time-series data (resampling to 3 mm3 voxels). A voxel level detrending procedure was applied to remove time-series components correlated with global fluctuations in the BOLD signal (Macey et al., 2004). Last, the time-series data were spatially smoothed to a 6 mm3 full-width half-maximum Gaussian kernel. Single-subject time series data were submitted to first-level general linear statistical models (Friston et al., 1994) examining the face/place localizer, adaptation experiment 1a, and control adaptation experiment 1b, respectively. Each model included within-session global scaling (default), high-pass filtering to remove low-frequency signal drift (period = 128 s), and the AR1 method of estimating temporal autocorrelation. We used the separate face/place functional localizer scan to isolate right hemisphere FFA and PPA regions of interest (ROIs) within each participant. For the localizer task, 153 time points were collected, of which the first 12 were discarded to account for T1 equilibration (for a total of 141 reconstructed time-points). In each first-level design matrix, we separately modeled face and place epochs using two boxcar regressors, convolved with the canonical hemodynamic response function (HRF). Separate linear t-contrasts were specified for [faces > places] and [faces < places] using a false discovery rate (FDR) (Genovese et al., 2002) corrected p < 0.01. For each participant, a voxel that was maximally face or place selective was selected within the anatomically defined (Tzourio-Mazoyer et al., 2002) fusiform gyrus and parahippocampal gyrus/collateral sulcus, respectively. The corresponding MNI coordinates were entered into the MarsBar toolbox (Brett et al., 2002) as the centroids of 3 mm radius spherical ROIs. See supplemental Tables S1 and S2, available at www.jneurosci.org as supplemental material, for individual ROI coordinates. In each of the 4 task runs of the perceptual attention task, 131 time points were collected, of which the first 3 were discarded (512 reconstructed volumes). In each first-level design matrix, we modeled stimulus repetition (exposures 1–5) using 5 separate delta function regressors. Because young and older subjects exhibited a small but statistically significant difference in decision accuracy, we also modeled incorrect trials as a separate regressor; comparisons between first level design matrices with and without separation of incorrect trials revealed negligible differences. The six motion parameters produced at image realignment were also included as covariates of no interest. For each subject, we constructed t-contrasts modeling the linear effect of stimulus repetition, which were subsequently used for whole-brain random-effects analysis (2-sample t test). Group × repetition interactions were interrogated using an uncorrected p < 0.005 height and a 10 voxel extent as base thresholds. Activations surviving a cluster-level corrected p < 0.05 were deemed statistically significant. In both the FFA and PPA, exposures 1–5 were separately modeled using 12 finite impulse response (FIR) functions, one for each peristimulus time point (trial window = 24 s). To determine which time points should be entered for comparison in our random-effects ANOVAs, we averaged the time courses across exposures 1–5. The numerical peak was statistically compared with each of the other time points. The peak response in both the FFA and PPA occurred 6 s after trial onset; this time point was significantly greater than all others (t tests, p < 0.05). To calculate the magnitude of FFA and PPA adaptation, we subtracted the peak hemodynamic response at exposure 5 from exposure 1 for each participant. These values were subsequently used for the brain–behavior regressions. In each first-level design matrix, we used 3 parametric regressors to model stimulus repetition, exponentiated lag, and the interaction between repetition and lag for stimulus exposures 2–5. First exposures were modeled as a separate regressor of no interest. The exponentiated lag function was: exp(-n/48), where n is number of intervening trials and 48 is the maximum possible lag (Henson et al., 2000). The six motion parameters produced at image realignment were also included as covariates of no interest. Because the lag model used parametric modulation, we submitted t-contrasts modeling the lag regressor to separate random effects analyses for young and older adults, respectively. Whole-brain statistical parametric maps were interrogated using one sample and two sample (between groups) t tests set at an uncorrected p < 0.005 height and a 10 voxel extent as base thresholds. To confirm that lag effects identified in the one sample t tests were localized within the FFA, we used a separate FFA mask for young and older adults, defined using the [face > place] contrasts from random effects analyses of the face/place localizer (young: center of mass x = 41, y = −54, z = −20, volume = 6128 mm3; old: center of mass x = 39, y = −50, z = −19, volume = 5040 mm3). Voxels surviving a small volume correction, FDR p < 0.05, were deemed statistically significant (Genovese et al., 2002). In the perceptual attention task, 244 time points were collected, of which the first 3 were discarded (241 reconstructed volumes). In each first-level design matrix, we modeled repetition, alternation, and target trials using 3 separate delta function regressors. As in previous studies of perceptual adaptation (Kourtzi and Kanwisher, 2001; Summerfield et al., 2008), each pair of faces was treated as a compound trial in the fMRI analyses. The six motion parameters produced at image realignment were also included as covariates of no interest. To produce time courses for the repetition and alternation conditions, we used the same ROIs and signal extraction procedures described for experiment 1a. We examined response latency performance on the perceptual attention task using a 2 (age) × 5 (repetition) repeated measures factorial ANOVA. Behavioral data for one young subject were not recovered at the time of the scan. Significant main effects were detected both for the age (F(1,26) = 14.2, p = 0.001) and the face repetition factors (F(4,104) = 7.00, p < 0.001) (Fig. 1b). There was no interaction between age and repetition (F < 1). 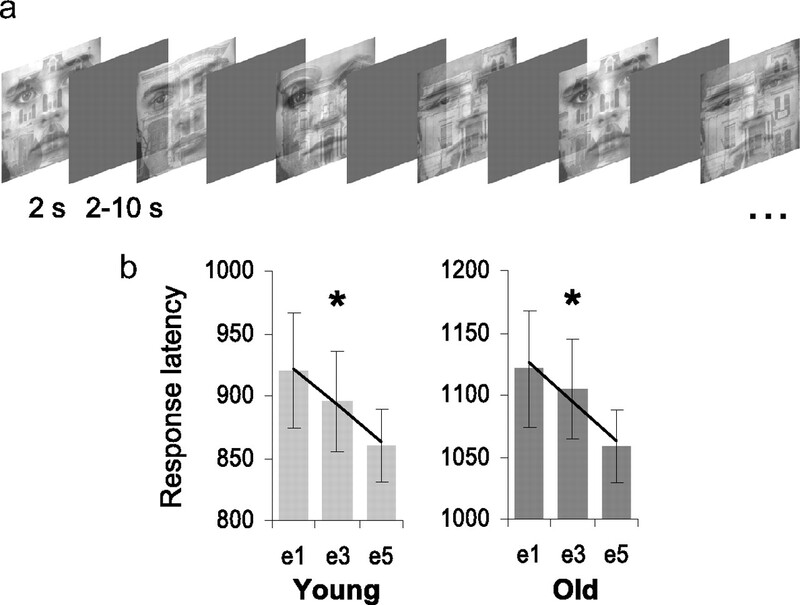 Taking into consideration the overall age-dependent slowing in response time, face repetition (exposure 1–5; e1–e5) elicited almost identical behavioral priming, i.e., decreased response latency, in young and older adults. Specifically, decreases in response latency over face repetitions were equivalent both in linearity (young: Flinear, 1,13 = 4.9, p = 0.04; old: Flinear, 1,13 = 6.1, p = 0.03) and overall magnitude (young: e1–e5 = 59.4 ms; old: e1–e5 = 62.7 ms). Our comparison of response accuracy yielded a small but significant difference (t26 = 2.3, p = 0.03) between the young (mean = 96%, SD = 3.2) and older adults (mean = 93%, SD = 3.4), indicating that older adults committed slightly more errors discriminating male and female faces. Experiment 1a: perceptual attention task. a, Representative stimulus sequence. b, Equivalent magnitudes of behavioral priming, i.e. decreased response latency, were detected in both young and older adults across face exposures e1–e5 (linear F contrast: *p < 0.05). Response latencies are plotted in milliseconds on the y-axis and at exposures e1, e3, and e5 on the x-axis. There was an overall significant main effect of age, but no interaction between age and repetition (F < 1). We separately localized the extrastriate parahippocampal place (PPA) and fusiform face (FFA) cortical areas in each subject. The PPA and FFA regions of interest (ROIs) were used as extraction foci for the attention task, thereby obviating the need for multiple statistical comparisons (Saxe et al., 2006) (see Figs. 2b, 3b; supplemental Tables S1 and S2, available at www.jneurosci.org as supplemental material, respectively). We restricted our ROI analyses to the right hemisphere, as lateralized FFA effects have been detected for both magnitude and selectivity of the hemodynamic response to faces (Kanwisher et al., 1997; Grill-Spector et al., 2004). To interrogate whether patterns of cortical activity differed in each extrastriate cortical ROI as a function of stimulus repetition and age, we first conducted separate 2 (age) × 5 (repetition) repeated-measures factorial ANOVAs examining the PPA and FFA. Where applicable, we report linear and nonlinear effects from the within-subjects contrasts of each model. Age differences in the parahippocampal place area (PPA). a, Young adults (blue) did not exhibit significant repetition-related changes to unattended places in the PPA. Older adults (red) exhibited significant PPA adaptation to unattended places. Maximal repetition-related adaptation was detected between the first and fifth exposures. Inset box-plots: Percentage signal change in right PPA (y-axis) at exposures e1, e3, and e5 (x-axis); linear F contrast: *p = 0.03. Impulse response function plots: Percentage signal change in right PPA (y-axis) at e1 (solid line) and e5 (hashed line) plotted over peristimulus time (x-axis); within-subjects t test: **p = 0.007. b, Locations of individual PPAs from the separate functional localizer scan are superimposed on a template brain in Montreal Neurological Institute (MNI) space; see supplemental Table S1, available at www.jneurosci.org as supplemental material. c, Brain–behavior relationship examining the magnitude of PPA adaptation (e1–e5; y-axis) across older individuals and their performance on a place recognition task (x-axis) obtained 10 min after fMRI task; **r = 0.68, p = 0.007. We found a main effect of age in the PPA (F(1,26) = 5.3, p = 0.03) and a trend toward a main effect of age in the FFA (F(1,26) = 3.3, p = 0.08). Post hoc t tests revealed that young adults exhibited significantly higher overall activation in the PPA (t26 = 2.3, p = 0.03) across repetitions, and a trend toward higher overall activation in the FFA (t26 = 1.8, p = 0.08). These repetition-independent age differences in global BOLD response are likely attributable to changes in neurovascular function among older adults (D'Esposito et al., 2003). For the PPA, we found a significant age × repetition interaction (F(4,104) = 2.6, p = 0.04), suggesting that younger and older adults exhibited different adaptation profiles to unattended places. We therefore decomposed the PPA factorial model into 2 separate repeated-measures ANOVAs to examine PPA repetition effects separately in young and older adults. Consistent with effective early selection in young adults, the PPA was not significantly modulated by the repetition of unattended place images (Fig. 2a). By contrast, in older adults, the PPA exhibited a linear decrease over repetitions (Flinear, 1,13 = 6.4, p = 0.03). Post hoc t tests revealed significant and maximal attenuation in PPA response when comparing first and fifth face exposures (t13, e1-e5 = 3.2, p = 0.007) (Fig. 2a). Furthermore, between groups comparisons of the magnitude of PPA adaptation—the difference between e1 and e5—revealed stronger place encoding in older compared with younger adults (t26 = 3.0, p = 0.007). 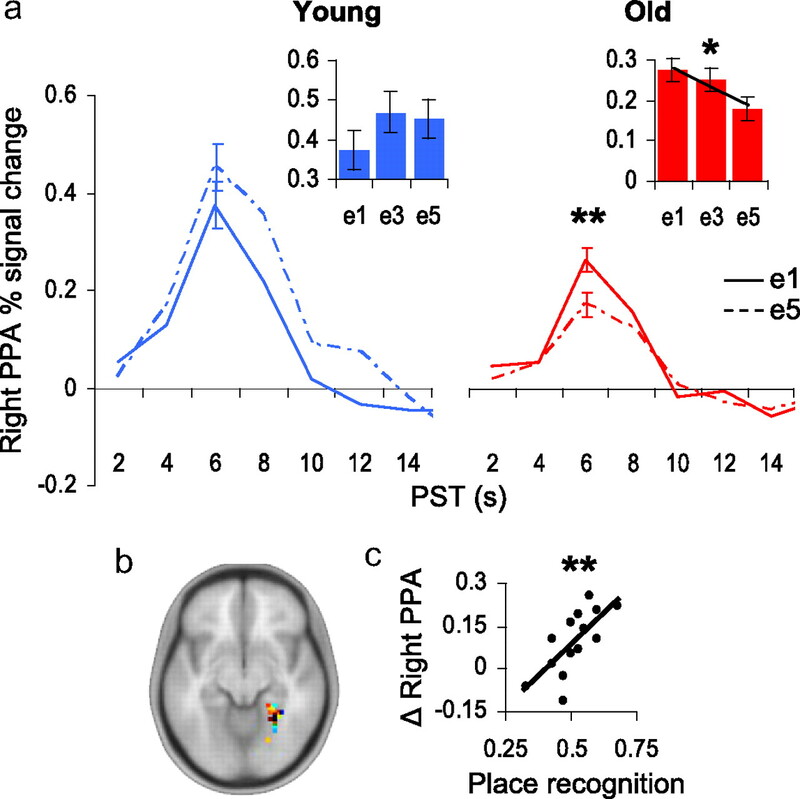 We next determined whether PPA indices of incidental place learning in older adults might yield consequent age differences in recognition for this information. Following the attention task, participants were required to determine which of two place stimuli (one novel, one familiar) matched a previously seen face. No significant age-related differences were detected (t26 < 1); both young and older adults appeared to perform at chance accuracy, 51% and 52%, respectively. However, within healthy older adult samples, variability in attentional impairment might obscure age-related differences in recognition memory for task-irrelevant information (Gazzaley et al., 2005). Thus, to better account for individual differences in recognition, we examined with regression analyses the relationship between place adaptation in the PPA (e1-e5 difference value; with higher positive values indicative of greater PPA adaptation) and post-task recognition of the familiar places. Indices of FFA adaptation were also included in the regression models as a covariate. In older adults, we found that PPA adaptation was significantly predictive of post-task place recognition (t13, PPA = 3.3, r = 0.68, p = 0.007) (Fig. 2c). In young adults, the relationship between PPA adaptation and post-task place recognition was nonsignificant (t13, PPA < 1, r = 0.20). To determine whether “nonsuppressors,” i.e., older adults who exhibited larger PPA adaptation, recollected places better than chance (50%), we isolated 6 individuals falling ½ of a SD above the mean value of our neural index of PPA adaptation. Nonsuppressors were found to recognize the task-irrelevant places significantly better than chance (t5 = 2.8, p = 0.03). To better assess potential group differences between the smaller older adult subsamples, we performed 2-sample nonparametric Wilcoxon rank-sum tests. Nonsuppressors recognized places significantly better than “suppressors” (Z = 2.7, p = 0.006, two-tailed). We also explored the possibility that older adults falling within either subgroup might have engaged in different attentional strategies during the task. For instance, nonsuppressors might have determined whether the face was male or female faster than suppressors and used the remaining trial time to attend to places, or, nonsuppressors may have attended to places instead of faces altogether. Such differences in attentional strategy would be expected to yield differences in behavioral performance measures. We therefore compared between the two subgroups: mean response latency at each exposure (e1, e2, e3, e4, e5), mean response latency across all exposures, and mean response accuracy across all exposures. These analyses failed to yield significant differences (all Z-values <1, except e3, Z = 1.1, p = 0.25, and mean accuracy, Z = 1.3, p = 0.19), suggesting that the suppressor and nonsuppressor subgroups did not employ different attentional strategies on the task. While the subgroup comparisons should be considered provisional due to small sample sizes, these findings provide additional evidence that incidental place encoding accompanied face encoding in older adults, and, consistent with prior work (Gazzaley et al., 2005), suggest that the magnitude of task-incidental encoding varied within the healthy older adult sample. For the FFA, we found no significant age × repetition interaction effects (F(4,104) < 1), though a trend toward a main effect of repetition was detected (F(4,104) = 2.3, p = 0.07). Based on prior research (Yi and Chun, 2005; Yi et al., 2006), we reasoned that young adults may have preferentially contributed to the FFA repetition trend. Consistent with our prediction, a reduced ANOVA model including only young adults yielded a significant linear effect of FFA adaptation to repetitions of attended faces (Flinear, 1,13 = 5.3, p = 0.04). Post hoc t tests confirmed that FFA signal in younger adults was significantly attenuated by the repetition of face images (t13, e1–e5 = 2.7, p = 0.02) (Fig. 3a). The between groups comparison did not significantly differentiate the magnitude of FFA adaptation as a function of age (t26 = 1, p = 0.31), likely due to a weak pattern of adaptation observed in older adults. Age differences in the fusiform face area (FFA). a, Young adults (blue) exhibited a significant linear effect of FFA adaptation to repeated attended faces. Maximal repetition-related adaptation was detected between the first and fifth exposures. For older adults (red), no significant effects of face repetition were detected in the FFA. Inset box-plots: Percentage signal change in right FFA (y-axis) at exposures e1, e3, and e5 (x-axis); linear F contrast: *p = 0.04. Impulse response function plots: Percentage signal change in right FFA (y-axis) at e1 (solid line) and e5 (hashed line) plotted over peristimulus time (x-axis); within-subjects t test: *p = 0.02. b, Locations of individual FFAs; see supplemental Table S2, available at www.jneurosci.org as supplemental material. c, For older adults, the brain–behavior regression slope for FFA adaptation was not significant by itself, but was significantly different from the slope for the PPA brain–behavior relationship (hashed trend-line), t test: **p < 0.01, indicating that those older adults exhibiting the strongest post-task place recognition accuracy had highest magnitudes of PPA adaptation and, additionally, the lowest magnitudes of FFA adaptation. There was no significant brain–behavior relationship between FFA adaptation (e1–e5) and post-task recognition in either old (t13, FFA < 1, r = −0.17) or younger (t13, FFA < 1, r = 0.16) adults. However, when we used a t test of nonindependent r-values (Howell, 2007) to directly compare the FFA and PPA correlations with post-task recognition within the older adult sample, we found that those older adults exhibiting the strongest post-task place recognition accuracy also had the highest magnitudes of PPA adaptation and, conversely, the lowest magnitudes of FFA adaptation (t11 = 3.12, p < 0.01) (Fig. 3c). Under conditions of competing perceptual input, it is possible that older adults exhibit FFA adaptation to repeated faces at short intervals of time, but that this cortical representation decays more rapidly compared with younger adults due to age-differences in implicit visual memory (Fleischman and Gabrieli, 1998). Because the order of stimulus presentation was randomized in experiment 1a, face repetitions occurred after varying numbers of intervening trials of unlike faces, or lag. In older adults then, FFA adaptation might exhibit greater decay over time due to greater interference from intervening trials. We therefore examined FFA response to stimulus repetition (exposures 2–5) as a function of repetition lag in a separate post hoc analysis. The between groups comparison failed to detect a significant effect of age on repetition lag, i.e., on the linear regression of repetition lag on FFA response, or on occipitotemporal regions outside of the FFA ROI. To confirm that the FFA was sensitive to repetition lag in our experiment, we also evaluated each group separately. 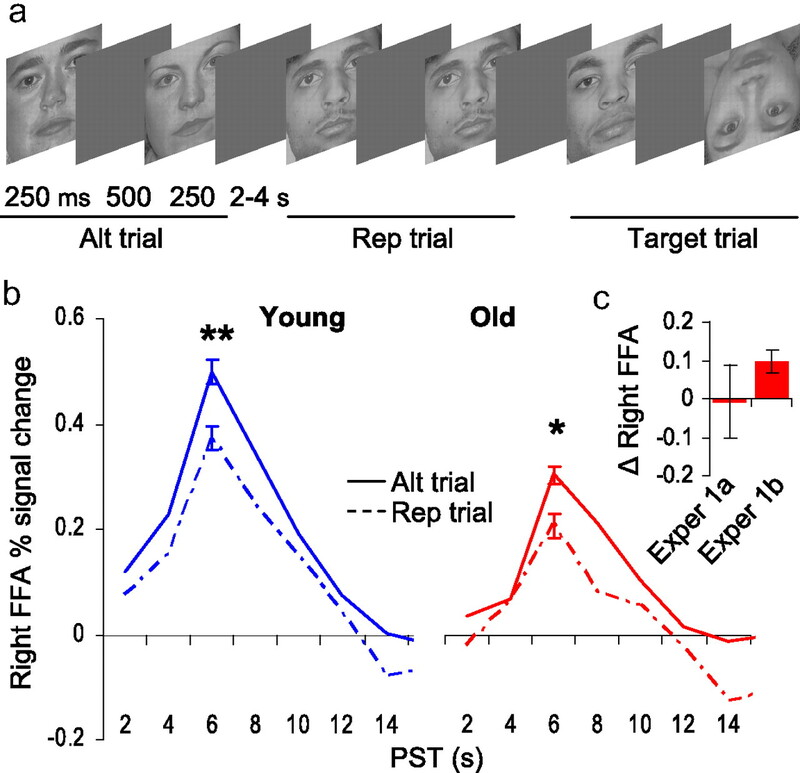 Both young (t13 = 5.76, p < 0.001) and older adults (t13 = 5.15, p < 0.001) exhibited a significant and selective effect of lag in the right FFA, where the magnitude of neural adaptation to a repeated face decreased with increasing number of intervening trials (Henson et al., 2004) (see supplemental Figure S1, available at www.jneurosci.org as supplemental material). The qualitative similarity between FFA lag profiles in young and older adults, together with the equivalent patterns of behavioral priming for repeated faces in both groups, indicate that our task did not evoke age differences in implicit memory, or other forms of perceptual decay, across trials. Last, we conducted follow-up whole-brain analyses to explore the possibility that older adults differentially use attentional resources at stages of processing after extrastriate encoding of place information. 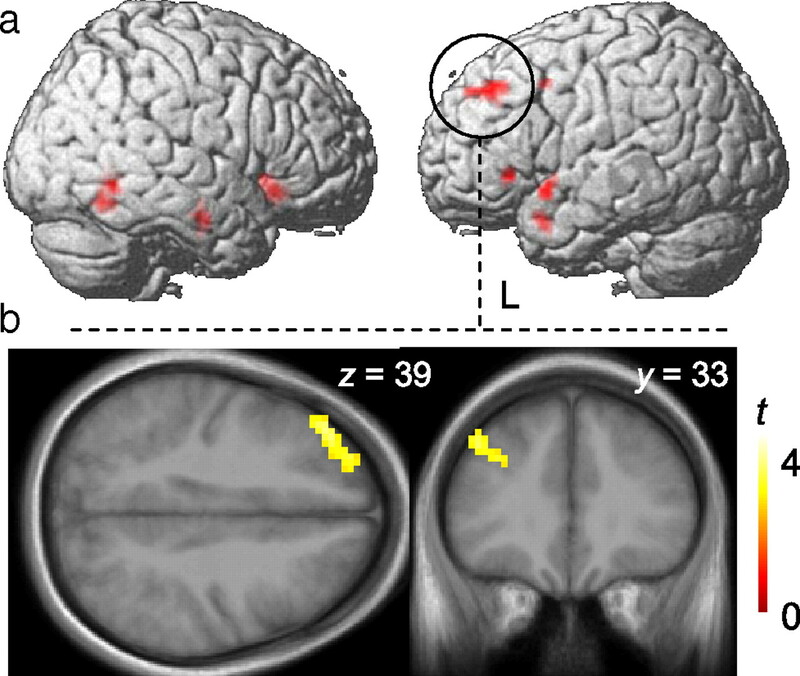 We found an area in the left middle frontal gyrus (MFG) that exhibited a larger magnitude of perceptual adaptation—i.e., linear repetition-related reductions in BOLD signal—in older adults compared with younger adults (cluster-level corrected p < 0.05; MNI coordinates: x = −39, y = 36, z = 39, Brodmann area 46) [see Fig. 4a,b; supplemental Table S3 (available at www.jneurosci.org as supplemental material) for additional brain areas exhibiting group × repetition interactions that did not survive a corrected p-threshold]. Furthermore, we also found a significant brain–brain correlation in older adults between the magnitude of FFA adaptation and left MFG adaptation, in which smaller magnitudes of FFA adaptation correlated with greater magnitudes of MFG adaptation (r = −0.57, p = 0.03). The equivalent correlation between the PPA and left MFG was nonsignificant (r = −0.12, p = 0.69). Adaptation magnitude in the left MFG did not correlate with either FFA or PPA adaptation in young adults. Whole-brain analysis. a, The left middle frontal gyrus (MFG) exhibited a larger magnitude of perceptual adaptation—i.e. linear repetition-related reductions in BOLD signal—in older adults compared with younger adults, cluster-level corrected p < 0.05; MNI coordinates: x = −39, y = 36, z = 39; Brodmann area 46. Rendered activations are superimposed on a template brain (Colin27). b, An axial (left) and coronal (right) slice of the same left MFG activation is displayed on an older adult template brain created from an average of older adult participants' high-resolution T1 structural scans using voxel-based morphometry (VBM5), part of the SPM5 software package. In sum, older adults exhibited an age-related impairment in early perceptual selection, as indexed in extrastriate cortices. Additionally, in older adults the greater magnitudes of left MFG adaptation, together with the selective relationship between MFG and FFA adaptation, suggest that this late frontal mechanism is related to goal-directed attentional processing; those older individuals exhibiting the weakest attentional modulation of face adaptation in the FFA were also those exhibiting the strongest attentional modulation of stimulus adaptation in the MFG. We next examined whether our PPA results reflect true age-related differences in perceptual attention, or alternatively, a general decline in visual cortical object-selectivity among healthy older adults. Research in nonhuman animals has shown that visual cortical neurons in healthy senescent monkeys exhibit decreased stimulus selectivity and increased spontaneous activity, both of which adversely affect the signal-to-noise ratio of sensory input (Schmolesky et al., 2000; Wang et al., 2005). Assuming such age-related deficits extend to humans, we used fMRI to determine whether impaired visual cortical plasticity is observable in older adults independent of perceptual competition. In a separate control experiment comparing a subset of our older sample (n = 6) against young controls (n = 6), we tested this hypothesis with a face adaptation task (Summerfield et al., 2008) in which we removed competing perceptual information (places) and task-related decision criterion (male/female). In the task (Fig. 5a), 2 faces were presented in succession, comprised of either the same (repetition) or different faces (alternating). Participants simply monitored the stimulus sequence for occasional inverted faces (targets). Limiting our comparisons to alternating and repetition trials, we found that both young (t5 = 5.3, p = 0.003) and older adults (t5 = 3.2, p = 0.02) exhibited robust FFA adaptation to repeated faces (Fig. 5b). The magnitude of FFA adaptation did not differ between groups (Wilcoxon rank-sum test: Z < 1), nor did the magnitude of PPA adaptation—in the absence of place information—differ between groups (Z < 1). Note that individuals in our older subsample exhibited impaired FFA adaptation in experiment 1a but not experiment 1b (Fig. 5c). 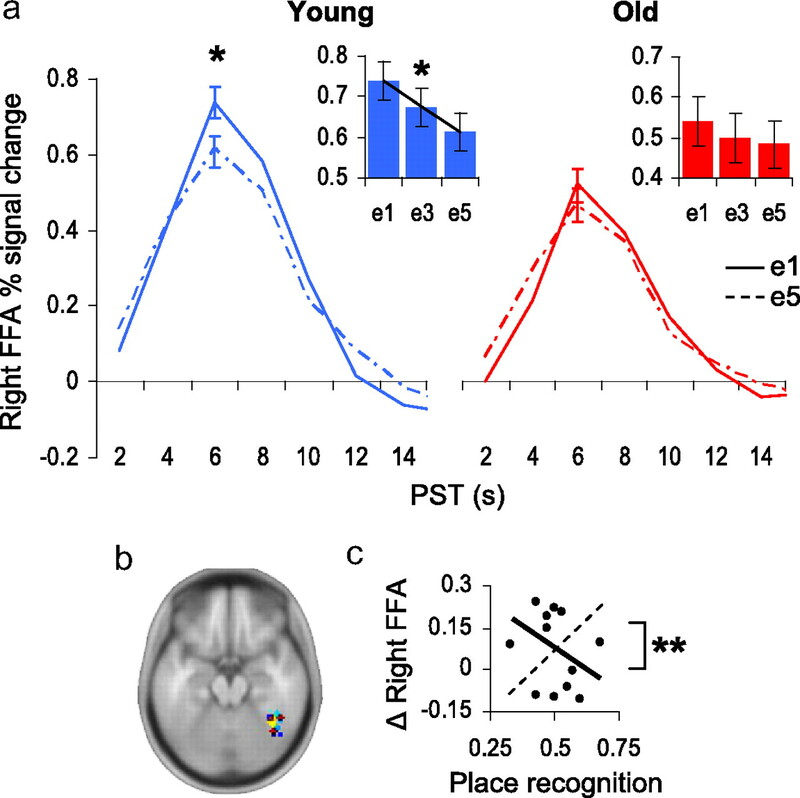 Hence, age-related changes in early selection do not arise from general impairment of visual cortical plasticity or PPA object selectivity, but rather a greater susceptibility to perceptual competition from task-irrelevant visual information. Experiment 1b: control perceptual attention task. a, Representative stimuli and trial structure for alternation, repetition and target trials. b, In both young (blue) and older adults (red), greater FFA adaptation (attenuation) was observed on repeated face trials compared with alternating face trials. Impulse response function plots: Percentage signal change in right FFA (y-axis) for alternating face (solid line) and repeated face (hashed line) trials, plotted over peristimulus time (x-axis). c, Comparison of FFA adaptation to repeated faces in the older subgroup for experiment 1a (exper 1a; y-axis: e1–e5) and experiment 1b (exper 1b; y-axis: alt−rep). Perceptual competition from unattended places impaired FFA adaptation to attended faces in experiment 1a. Collectively, our findings provide novel evidence that perceptual attention is susceptible to an age-related impairment, and further, that this impairment fundamentally impacts visual encoding of object information in older adults. Our task design enabled us to simultaneously index category-selective perceptual processing inside and outside the focus of perceptual attention. In young controls, adaptation to repeating attended faces was preserved in the FFA to the exclusion of PPA adaptation to repeating unattended places, indicative of intact early suppression of places before encoding (Yi et al., 2004, 2006; Yi and Chun, 2005). By contrast, older adults exhibited a failure of early selection, as indexed by significant PPA adaptation as well as the selective positive relationship between the magnitude of PPA adaptation and post-task place recognition. Specifically, those older adults who demonstrated the poorest early selection of unattended places, i.e., greatest PPA adaptation, had better subsequent recognition of the initial face-place pairings. Accordingly, we posit that under perceptual load, older adults exhibit impaired early selection of unattended information at the level of the receptive field. Further, in older adult nonsuppressors, unattended information was successfully recovered from recognition memory, indicating that these individuals unintentionally co-encoded both the face and place dimensions of each stimulus. Perceptual attention is engaged when directing attention to one of multiple distinct objects presented simultaneously in the visual field (Rees et al., 1997; Kastner and Pinsk, 2004; Yi et al., 2004, 2006; Yi and Chun, 2005). Within the visual cortex, perceptual attention suppresses neural competition from irrelevant objects, thereby enhancing the target representation (Kastner et al., 1998, 2001). Neuroimaging research has shown that the magnitude of this modulatory bias scales with larger receptive field sizes, proceeding from areas V1 to V4, with the largest attentional modulations observed in extrastriate areas where receptive fields are large enough to encompass whole objects (Kastner et al., 2001). As the perceptual load of a visual task increases, target-related visual cortical activity increases in the extrastriate cortices, while distractor-related activity decreases (Pinsk et al., 2004; Yi et al., 2004). At the level of the receptive field, this pattern has been characterized as a interdependent push-pull mechanism in which target enhancement also yields distractor suppression (Pinsk et al., 2004). Our brain–behavior results suggest the intriguing possibility that a reduced discriminatory signal originating from receptive field push-pull mechanisms might underlie age-related declines in perceptual attention. Specifically, when we directly compared brain–behavior relationships in the FFA and PPA, we found that those older adults who exhibited the strongest post-task place recognition accuracy had both the highest magnitudes of PPA adaptation and also the lowest magnitudes of FFA adaptation. Hence, as a function of face/place recognition performance, those older adults who failed to enhance the attended faces also failed to suppress the unattended places. Selective attention tasks, such as ours, that require semantic classification of repeated visual stimuli have been found to evoke neural adaptation in both the extrastriate visual and lateral frontal cortices (Schacter and Buckner, 1998; Henson, 2003; Bunzeck et al., 2006). These concurrent findings are thought to reflect distinct posterior perceptual (object recognition) and frontal conceptual (semantic classification) components of adaptation (Schacter et al., 2004; Wig et al., 2005). For instance, using fMRI combined with repeated transcranial magnetic stimulation (rTMS), Wig et al. (2005) showed that disruption of frontal cortical activity by rTMS abolishes both frontal correlates of adaptation and behavioral priming, while sparing perceptual adaptation in the visual cortex. Hence, adaptation in the ventral visual cortices appears to be dissociable from recurrent influences of goal-directed frontal decision mechanisms, i.e., perceptual priming influences behavioral priming but not vice versa (Xu et al., 2007). Collectively, our data suggest that under conditions of competing task-relevant and -irrelevant perceptual input, behavioral indices such as priming can obscure important age-related differences in perceptual attention at the neural level. Behavioral priming on the attention task was equivalent between groups. Repetition-related age differences emerged only at the neural level in PPA and left MFG during encoding, and the influence of these neural antecedents on performance became apparent only after we probed the relationship between the PPA index of incidental encoding and post-task recognition of the initial face-place pairings. Compensatory frontal activations in older adults have been associated with degradation of cortical microcircuitry in the executive system (Cabeza et al., 1997; Madden et al., 1999; Grady et al., 2002). Here we provide evidence that learning-related adaptation in left MFG can arise from impaired early selection, i.e., a “leaky” perceptual filter. Young adults successfully filtered unattended places before extrastriate encoding in the PPA, consistent with intact early selection mechanisms embedded in posterior perceptual cortices. Older adults, by contrast, exhibited significantly greater magnitudes of neural adaptation in both PPA and left MFG compared with young adults. During visual selective attention, de Fockert et al. (2004) observed increased activation in left inferior frontal junction under perceptual competition from visually salient distractors, indicating that the left frontal cortex is involved in perceptual attention. Consistent with this interpretation, we also found a selective brain–brain correlation between magnitudes of FFA and more anterior left MFG cortical adaptation in older adults, wherein weaker magnitudes of FFA adaptation to attended faces were found to correlate with stronger magnitudes of left MFG adaptation. Together, the extrastriate and left MFG findings suggest that attentional selection was redistributed in older adults from posterior perceptual to goal-directed frontal mechanisms due to an age-related “leakiness” of early perceptual filters. The left MFG in particular (approximately Brodmann area 46) has previously been found to exhibit practice-related changes in neural activation during WM, e.g., for faces (Sayala et al., 2006), objects/locations (Landau et al., 2007) and simple three-dot configurations (Garavan et al., 2000). In these studies, the left MFG was one of several regions that exhibited a practice-related decrease in BOLD response, particularly during WM encoding as opposed to maintenance or retrieval (Sayala et al., 2006; Landau et al., 2007), and independent of practice-related changes in behavioral performance (Sayala et al., 2006). Hence, in the context of WM tasks, experience-dependent decreases in left MFG response have been attributed to more efficient encoding of task-relevant information, i.e., decreased competition from task-irrelevant distractors. Tying together the results of Yi et al. (2004), which distinguished executive forms of attention such as WM as a late selection process, these studies implicate the left MFG as a putative neural substrate that mediates late selection during WM. However, in older adults we observed repetition-related decreases in left MFG response in the absence of WM demands, and most strongly in those older individuals also exhibiting the weakest attentional modulation of task-relevant faces in the FFA. Our findings therefore implicate the left MFG as a possible locus of age-compensatory late selection for task-relevant perceptual information. Elsewhere, indirect behavioral and fMRI evidence have suggested that older adults unintentionally process task-incidental sensory information more so than young controls. For instance, older adults exhibit baseline increases in multisensory integration during modality-specific attention (Hugenschmidt et al., 2009), and, increased distraction from ambient sensory information within the experimental environment (Stevens et al., 2008). During passive viewing of repeating objects superimposed over novel scenic images, Chee et al. (2006) found that visual cortical adaptation to objects was preserved in young adults but impaired in older adults. Notably, when attention was directed to the superimposed object in a separate condition, visual cortical adaptation to repeated objects was observed in both groups. Although the precise neural fate of the scene information was not explored by Chee et al. (2006), we hypothesize that in the directed attention condition, scene-sensitive extrastriate cortical regions would reveal age-related increases in task-incidental processing, despite inattention to scenes. We extend on these prior studies by indexing the unattended stream of sensory input at the stage of perceptual encoding in category-selective extrastriate cortex and recognition memory. Our study provides novel evidence that perceptual attention is susceptible to age-related decline. Under perceptually demanding conditions, early selection mechanisms observed in young adults are significantly impaired in older adults, yielding fundamental age differences in the contents of visually encoded information. Collectively, our findings therefore suggest that declining selective attention in healthy older populations cannot be unitarily attributed to impairment of late selection mechanisms. However, the age-related changes in neural function that underlie this early selection impairment are unresolved. One possibility points to the normative loss of cholinergic function observed in the aging brain (Bartus et al., 1982; Mesulam, 1996). High levels of cortical acetylcholine have been associated with feedforward modes of sensory processing (Hasselmo, 2006). For instance, animal (Sato et al., 1987; Hasselmo, 1995) and neuroimaging (Furey et al., 2000; Bentley et al., 2004) research has shown that increased cortical acetylcholine boosts the signal-to-noise ratio of neurons in the visual cortex, facilitating the salience of task-relevant percepts. Individual differences in central cholinergic integrity might therefore explain the variance in incidental place encoding observed in our older sample. Because the task presented in this study did not include an explicit manipulation of perceptual load, e.g., different thresholds of unattended place opacity, another important avenue for this research will be to examine age-related susceptibilities at varying levels of perceptual load. Work to examine these possibilities is underway in our lab. Our findings provide important initial evidence that the vulnerability to distraction observed in older adults (Hasher and Zacks, 1988) can arise in part from a failure in early selection, i.e., a leaky attentional filter. Looking beyond attention tasks such as ours, age-related impairments of perceptual selection may broadly influence many of the cognitive deficits typically observed in normal aging. This work was supported by Grant MOP102637 from the Canadian Institutes of Health Research to E.D.R. and the Vanier National Science and Engineering Research Council Scholarship to T.W.S. We also thank Adam K. Anderson and Daniel H. Lee for helpful editorial input on the manuscript. (2002) Detection versus estimation in event-related fMRI: choosing the optimal stimulus timing. Neuroimage 15:252–264. (2002) 8th International Conference on Functional Mapping of the Human Brain (June 2–6, 2002, Sendai, Japan), Region of interest analysis using an SPM toolbox [abstract]. (2006) Category-specific organization of prefrontal response-facilitation during priming. Neuropsychologia 44:1765–1776. (1997) Age-related differences in neural activity during memory encoding and retrieval: a positron emission tomography study. J Neurosci 17:391–400. (2006) Age-related changes in object processing and contextual binding revealed using fMR adaptation. J Cogn Neurosci 18:495–507. (2001) The role of working memory in visual selective attention. Science 291:1803–1806. (2003) Alterations in the BOLD fMRI signal with ageing and disease: a challenge for neuroimaging. Nat Rev Neurosci 4:863–872. (1998) Repetition priming in normal aging and Alzheimer's disease: a review of findings and theories. Psychol Aging 13:88–119. (1994) Analysis of functional MRI time-series. Hum Brain Mapp 1:153–171. (2000) Cholinergic enhancement and increased selectivity of perceptual processing during working memory. Science 290:2315–2319. (2000) Practice-related functional activation changes in a working memory task. Microsc Res Tech 51:54–63. (2005) Top-down suppression deficit underlies working memory impairment in normal aging. Nat Neurosci 8:1298–1300. (2008) Age-related top-down suppression deficit in the early stages of cortical visual memory processing. Proc Natl Acad Sci U S A 105:13122–13126. (2002) Lateral prefrontal damage affects processing selection but not attention switching. Brain Res Cogn Brain Res 13:267–279. (2002) The effects of encoding task on age-related differences in the functional neuroanatomy of face memory. Psychol Aging 17:7–23. (2004) The fusiform face area subserves face perception, not generic within-category identification. Nat Neurosci 7:555–562. (1988) in The psychology of learning and motivation, Working memory, comprehension, and aging: a review and a new view, ed Bower GH (Academic, New York), pp 193–225. (1995) Neuromodulation and cortical function: modeling the physiological basis of behavior. Behav Brain Res 67:1–27. (2006) The role of acetylcholine in learning and memory. Curr Opin Neurobiol 16:710–715. (2008) Cognitive aging and increased distractibility: costs and potential benefits. Prog Brain Res 169:353–363. (2003) Neuroimaging studies of priming. Prog Neurobiol 70:53–81. (2004) The effect of repetition lag on electrophysiological and haemodynamic correlates of visual object priming. Neuroimage 21:1674–1689. (2000) Neuroimaging evidence for dissociable forms of repetition priming. Science 287:1269–1272. (1997) Proceedings of the 8th BMVC (September 5–8, 1997, Essex, United Kingdom), Distinctive descriptions for face processing. (2007) Statistical methods for psychology (Thomson Wadsworth, Belmont CA), Ed 6. (2009) Suppression of multisensory integration by modality-specific attention in aging. Neuroreport 20:349–353. (1998) Mechanisms of directed attention in the human extrastriate cortex as revealed by functional MRI. Science 282:108–111. (2001) Modulation of sensory suppression: implications for receptive field sizes in the human visual cortex. J Neurophysiol 86:1398–1411. (2007) Regional specificity and practice: dynamic changes in object and spatial working memory. Brain Res 1180:78–89. (1995) Perceptual load as a necessary condition for selective attention. J Exp Psychol Hum Percept Perform 21:451–468. (2004) Load theory of selective attention and cognitive control. J Exp Psychol Gen 133:339–354. (1996) Word meanings can be accessed but not reported during the attentional blink. Nature 383:616–618. (1998) Third IEEE International Conference on Automatic Face and Gesture Recognition (Nara, Japan), Coding facial expressions with Gabor wavelets, pp 200–205. (2004) A method for removal of global effects from fMRI time series. Neuroimage 22:360–366. (1999) Adult age differences in the functional neuroanatomy of verbal recognition memory. Hum Brain Mapp 7:115–135. (1998) CVC Technical Report #24, The AR Face Database (Purdue University, School of Electric and Computer Engineering, West Lafayette, IN). (1996) The systems-level organization of cholinergic innervation in the human cerebral cortex and its alterations in Alzheimer's disease. Prog Brain Res 109:285–297. (1999) fMRI evidence for objects as the units of attentional selection. Nature 401:584–587. (2004) Push-pull mechanism of selective attention in human extrastriate cortex. J Neurophysiol 92:622–629. (1997) Modulating irrelevant motion perception by varying attentional load in an unrelated task. Science 278:1616–1619. (1987) A functional role of cholinergic innervation to neurons in the cat visual cortex. J Neurophysiol 58:765–780. (2006) Divide and conquer: a defense of functional localizers. Neuroimage 30:1088–1096, discussion 1097–1099. (2006) Increased neural efficiency with repeated performance of a working memory task is information-type dependent. Cereb Cortex 16:609–617. (1998) Priming and the brain. Neuron 20:185–195. (2004) Specificity of priming: a cognitive neuroscience perspective. Nat Rev Neurosci 5:853–862. (2000) Degradation of stimulus selectivity of visual cortical cells in senescent rhesus monkeys. Nat Neurosci 3:384–390. (2008) A neural mechanism underlying memory failure in older adults. J Neurosci 28:12820–12824. (1969) Strategies and models of selective attention. Psychol Rev 76:282–299. (2005) Degradation of signal timing in cortical areas V1 and V2 of senescent monkeys. Cereb Cortex 15:403–408. (2005) Reductions in neural activity underlie behavioral components of repetition priming. Nat Neurosci 8:1228–1233. (2005) Attentional modulation of learning-related repetition attenuation effects in human parahippocampal cortex. J Neurosci 25:3593–3600. (2004) Neural fate of ignored stimuli: dissociable effects of perceptual and working memory load. Nat Neurosci 7:992–996. (2006) Attentional modulation of repetition attenuation is anatomically dissociable for scenes and faces. Brain Res 1080:53–62.